Creativity is no more just inherited but can be improved and trimmed, and why not start this process at an early age. With the competition today that is continuously increasing at a speedy pace; why not do it in a fun way. If you are looking for technology that can be both fun and educational for children then, there is nothing better than the Metis Eddy Creativity Tablet. Metis is an education start-up that launched Android-based tablets in India targeted at children. The Eddy Creativity Tablet was launched in March 2015. The Eddy creativity table specifications include a 1.2GHz Dual-core Intel Atom Z2520 Processor and comes with 1GB RAM. The tablet has a wide 7-inch display with a resolution of 1024 x 600 pixels and has a 170 PPI density. This tablet is packed with 16GB of internal storage and is powered by a 2800mAh removable battery. The Creativity Tablet has a 2MP primary and a 2MP secondary shooter. This tablet runs on the latest Android v4.4.2 Jelly Bean OS and has Wi-Fi and Bluetooth as connectivity options. As an advantage, it comes preloaded with books, activities, apps, games, and videos. This tablet is child proof which makes it safe to use and provides unlimited learning with entertainment. 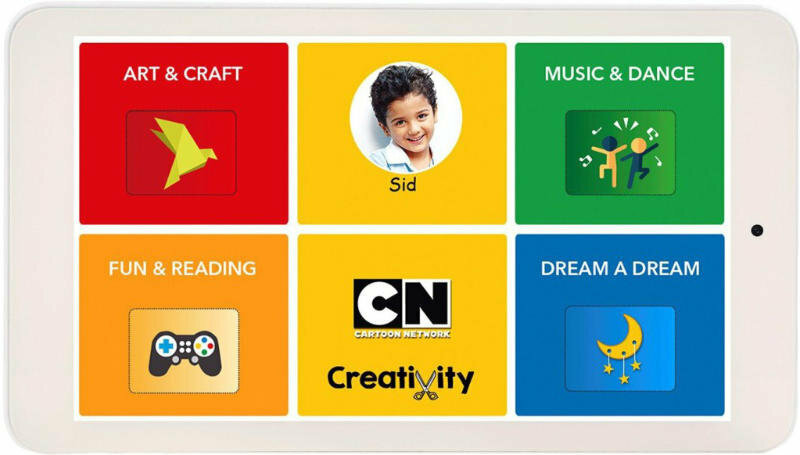 The Eddy Creativity Tablet price starts from INR 8,999. Eddy Creativity Tablet full specs and reviews as of Apr 2019. Buy it here!